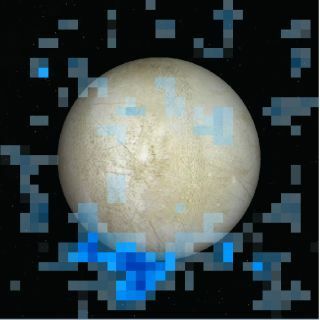 A south polar water vapor plume on Europa is shown in blue in this Hubble Space Telescope data image, which is superimposed on a visible light image of the Jupiter moon's leading hemisphere. Image released Dec. 12, 2013. SAN FRANCISCO — The apparent discovery of water geysers on Jupiter's moon Europa makes the icy body an even more attractive target for a life-hunting mission, researchers say. Scientists announced Thursday (Dec. 12) that they had detected transient plumes of water vapor erupting from Europa's south pole and extending about 125 miles (200 kilometers) into space. The ice-covered moon is thought to contain a subsurface ocean of liquid water, and the geysers represent a way to sample this potentially life-supporting environment, NASA officials said. An artist's illustration of Jupiter's icy moon Europa, with a water geyser erupting in the foreground while Jupiter appears as a backdrop. Images from the Hubble Space Telescope suggest Europa may have water plumes like Saturn's moon Enceladus. Image released Dec. 12, 2013. The new find, made using observations by NASA's Hubble Space Telescope, could build some momentum for a mission concept the space agency is developing called the Europa Clipper. The Europa Clipper probe would orbit Jupiter but make multiple flybys of the 1,900-mile-wide (3,000 kilometers) moon, using a number of different science instruments to study Europa's ice shell and subsurface ocean. The strategy would be similar to that employed by NASA's Cassini mission, which has made flybys of many Saturn moons since entering into orbit around the ringed planet in 2004. "What we have been doing is studying several approaches to really understand Europa from a spacecraft in that environment, and it looks like the Clipper concept is our best one," Green said. "Based on these [new] observations, we're going to redouble our efforts to take a good look at Clipper — its orbital trajectories, the plans for the mission architecture — to ensure that we have the right instrumentation and that we can cover this area very well and really, really understand it," he added. Artist's concept of the Europa Clipper mission investigating Jupiter's icy moon Europa. The Clipper could conceivably fly directly through Europa's plumes, taking samples as it goes, researchers said. The Europa Clipper is not formally on NASA's books; it remains a concept at the moment, and some rethinking may be required to make the mission a reality. For example, its price tag — estimated last year to be $2 billion — is too high to be approved in these tough fiscal times, Green said. The Clipper mission "is what we would call a flagship, and right now the budget horizon is such that we're deferring that kind of mission until later in the decade," he said. The European Space Agency, meanwhile, has its own plans to study Europa. ESA plans to launch a mission called the Jupiter Icy Moon Explorer, or JUICE, in 2022, with arrival in the Jovian system slated for 2030. JUICE will focus on three of Jupiter's moons: Ganymede, Callisto and Europa. However, the spacecraft will likely make just two flybys of Europa over the course of its mission, researchers said.